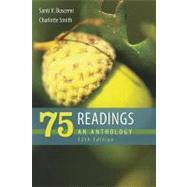 75 Readingsintroduces students to a range of classic and contemporary essays. The text also exposes them to a variety of rhetorical strategies, writing styles, themes, and topics. At the same time, it retains maximum flexibility for the instructor. These essays provide good structural models for rhetorical techniques and raise complex questions about current and enduring issues. Jo Goodwin Parker: What Is Poverty? Barbara Dafoe Whitehead: Where Have All the Parents Gone? Susan Casey: Our Oceans Are Turning into Plastic . . .Are We? Nat Hentoff: Should This Student Have Been Expelled? Alan M. Dershowitz: Shouting "Fire!"